﻿ 2 Kings 5:13 Then his servants came near and spoke to him and said, "My father, had the prophet told you to do some great thing, would you not have done it? How much more then, when he says to you, 'Wash, and be clean'?" But then his servants approached him and spoke with him. They said, "My father, had the prophet only asked of you something great, you would have done it, wouldn't you? Yet he told you, "Bathe, and be clean"!'" And his servants came near, and spoke to him, and said, My father, if the prophet had bid thee do some great thing, would thou not have done it? How much rather then, when he says to thee, Wash, and be clean? And his servants came near and said to him, My father, if the prophet had bid you to do some great thing, would you not have done it? How much rather, then, when he says to you, Wash and be clean? Then his servants came to him and said, If the prophet had given you orders to do some great thing, would you not have done it? 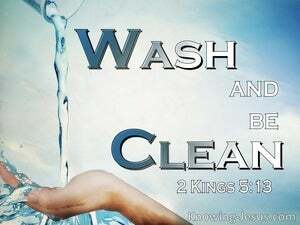 how much more then, when he says to you, Be washed and become clean? And his servants drew near, and spoke to him and said, My father, if the prophet had bidden thee do some great thing, wouldest thou not have done it? how much rather then, when he says to thee, Wash and be clean? Then his slaves came near and spoke unto him, and said, My father, if the prophet had bid thee do some great thing, would thou not have done it? 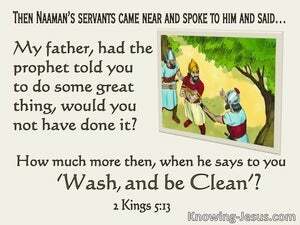 How much rather then, when he saith to thee, Wash and be clean? And his servants came near, and spoke unto him, and said, My father, if the prophet had bid you do some great thing, would you not have done it? how much rather then, when he says to you, Wash, and be clean? But his servants came near and spoke to him and said, "My father, [if] the prophet had spoken a difficult thing to you to do, would you not have done [it]? [Why not] even when he says to you, 'Wash and you shall be clean'?" And his servants came near and spoke to him and said, My father, if the prophet had told you to do a great thing, would you not have done it? How much rather then, when he says to you, Wash and be clean? Then came his servants and communed with him, and said, "Father if the prophet had bid thee done some great thing, oughtest thou not to have done it? 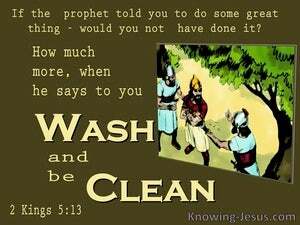 How much rather then shouldest thou do it, while he sayeth to thee only, 'Wash and be clean?'" His servants approached and said to him, "O master, if the prophet had told you to do some difficult task, you would have been willing to do it. It seems you should be happy that he simply said, "Wash and you will be healed." Then drew near his servants, and spake unto him, and said - My father! if, some great thing, the prophet had commanded thee, wouldst thou not have done it? then, how much rather, when he hath said unto thee, Bathe and be clean? And his servants came near, and spoke to him, and said, My father, if the prophet had bid thee do some great thing, wouldst thou not have done it? how much rather then, when he saith to thee, Wash, and be clean? 12 "Are not Abanah and Pharpar, the rivers of Damascus, better than all the waters of Israel? Could I not wash in them and be clean?" So he turned and went away in a rage. 13 Then his servants came near and spoke to him and said, "My father, had the prophet told you to do some great thing, would you not have done it? How much more then, when he says to you, 'Wash, and be clean'?" 14 So he went down and dipped himself seven times in the Jordan, according to the word of the man of God; and his flesh was restored like the flesh of a little child and he was clean. Elisha saw it and cried out, "My father, my father, the chariots of Israel and its horsemen!" And he saw Elijah no more Then he took hold of his own clothes and tore them in two pieces. So Hazael went to meet him and took a gift in his hand, even every kind of good thing of Damascus, forty camels' loads; and he came and stood before him and said, "Your son Ben-hadad king of Aram has sent me to you, saying, 'Will I recover from this sickness?'"